Most Mercury Sportjet boat owners want to perform at least a certain amount of their boat maintenance themselves to ensure continuing good performance and reliability. The more technical work should be performed by a certified Mercury technician who has the skills and diagnostic tools to troubleshoot and resolve issues with the different systems. Our Certified techs have over 100 years of combined experience in the event you need a higher level of assistance. To avoid unnecessary trips to the service center, it might be useful to have a checklist which can be run through systematically, in the hope of pinpointing problems quickly. The boat can be divided into three categories – jet unit, engine, and hull. The most important single instrument on the boat when considering performance drop-off is the tachometer. 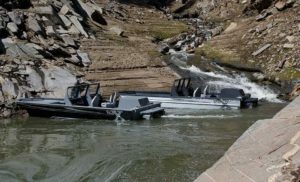 The great thing about jet boats is that the engine RPM’s should remain the same throughout the life of the boat, regardless of age, loading, water conditions, whatever. Your Sportjet engine should top out in the 5500 RPM range, give or take 150 RPM depending on the specific engine (Check your manual for your specific model. ie 175hp. 200, 210, 240, or 250hp). Most of our newer Sportjet powered boats are equipped with the Mercury Smartcraft Gauge. These gauges come in different flavors, from basic to giving you detailed info like fuel flow data, water temperature, water pressure, RPM, and even a diagnostic center. The most common system we now use in most of our boats not only sends a specific series of beeps for events like low oil, low voltage, or water in the gas, they actually give you the information on the screen in addition to the alarm code. Remember, a constant horn only means one thing, OVERHEAT. So take that code very serious. There is no situation where the RPM’s should be different from when the boat was new, and as an owner, you will know what these are. At any time, you should be able to open the throttle fully and get exactly the same maximum reading you have been used to. Or perhaps you are finding it needs more RPM’s to cruise with your normal load. RPM’s are a most important indicator of proper operation of the boat. A. Normal maximum RPM = hull problem. Overload: Too much weight aboard. Balance: Either too much weight aft, which will cause the nose to be too high and make getting on step difficult, or if the weight is too far forward, it will cause the nose to plow, difficult steering, wetness, and poor top speed. Reverse bucket: Is the bucket dragging in the reverse stream? Make sure the control is fully up. If you run a lot of silty water, the reverse gate bushings will wear faster. (As little as 50-75 hours) Reverse gate bushings are inexpensive to replace and should be checked regularly to avoid more expensive parts replacement. $15 worth of bushings can save you over $500 in nozzle and bucket components. (By the way, we can now rebuild a worn out reverse bucket with improved bushings for less than half of what a new one costs. Ask our service department for more information). To check your reverse gate bushing condition, simply grab both sides of the reverse gate and check it for slop. Anything over 1/8” inch of play indicates bushing wear. Over ¼” and you really need to get busy with the repair. Excessive hull drag: Is there some external hull obstruction such as rough surface, bent extrusion or other reason impeding the smooth flow of water over the hull bottom? A visual check on the trailer should reveal if there is. Aluminum hulls can have a “hook” bashed into them forward of the transom which can cause the bow to plow. The planing surface forward of the transom six to nine feet should be true and flat. Tunnel hulls can be affected by large dents just ahead of the tunnel. We use smooth rounded edges in the design of our unique tunnel hull, which minimizes bubbles and allows the boat to carve hard without cavitation. It amazes me how many boat manufacturers (that have not yet copied our tunnel design!) use sharp edges, angle iron strakes, etc on the bottom of their boats. Sharp edges cause bubbles. Bubbles cause cavitation, and cavitation causes poor handling and inferior performance. B. High rpm = jet unit problem. Higher than normal RPM’s, lack of thrust, slipping clutch feel, trouble getting a load up. Blockage: The most common problem is weeds and stones blocking the intake grate. Also be aware of rope, fishing line and willows winding around the pump shaft. Small sticks and stones can become lodged in the impeller affecting the performance dramatically; objects trapped in the impeller can cause the rotating assembly to be out of balance, causing severe vibration. Make sure the water passage through the jet is clear. First, check your intake for sticks or small rocks. Stomping the stomp grate will generally remove rocks in the intake, but not always remove grass, tree bark, etc. IMPORTANT: Always turn off the engine momentarily when clearing the stomp grate while on the water to avoid injecting objects at idle. Impeller or liner wear: The heart of the jet is the impeller and liner, and their condition. If you run in shallow gravel beds or across sand bars, the leading edges will become dull and inefficient. Pumping sand will increase the wear-ring to impeller clearance. This causes cavitation and loss of performance. All Sportjet come with a stainless impeller and an aluminum liner. It is suggested to upgrade to a stainless or UHMW liner sleeve if you are often operating in these conditions. If your impeller and pump housing are worn significantly, consider upgrading to a new impeller and a sleeved liner. The stainless liner is the most durable. The UHMW liner quiets the jet pump and provides better wear than aluminum but not as much as a stainless liner. Your existing impeller can be used for core credit toward new or reconditioned impellers. Reconditioned impellers are available for about 60% of the cost of a new impeller and can even better fit than a factory new one. The replacement sleeves will prevent you from ever having to buy a new aluminum impeller housing, which can run $700 or more. Note: The jet impeller is the water pump impeller on these boats. Unlike an outboard jet, there is no rubber water pump impeller to worry about. Bowl /stator vanes: It’s not too much of a problem, but the leading edge of the fixed stator vanes can become blunt and damaged. These can be inspected with a good flashlight while the boat is on the trailer. Throttle: Check that the throttle is opening fully. Fuel: A faulty fuel pump or inadequate fuel or air pressure may cause a decrease in performance or erratic RPM. (Surging/cutting out). Both fuel and air systems can be tested by a Mercury tech with the proper shop tools to make sure that they are in the normal operating ranges, and to make sure the high and low-pressure pumps are working properly. Ignition spark: Be satisfied the ignition system is operating properly. A problem here is usually indicated by a rough running or missing engine. Culprits could be as simple as a plug wire that is not attached, to a defective coil, ECM, harness issue, etc. We see very few problems with the ignition system on these engines. Reed valves: The Mercury Sportjet engines use reed valves for fuel entering the combustion chamber. The reed bocks have pedals that flex within the reed block, allowing fuel and air to pass. These reeds open about 5,000 times a minute when the RPM is 5000 RPM. Before 2012, all Mercury Sportjets came with steel reed pedals. Beginning in 2012 Mercury began producing their 200hp Optimax engines with fiberglass pedal reed valves for longer life and better, more reliable performance. If you own a 2011 or older Sportjet, consider replacing the reed valves with fiberglass pedals if your engine has close to 300 hours. Over 300 hours, you greatly increase the chance of having a metal reed valve pedals chip and it can do extensive damage to the engine in ingested. We can reuse your existing reed blocks in most cases which greatly reduces the cost of the parts used in the repair. (A little over $200 for the 6 pedal kits, plus installation). Provided your engine is getting its full quota of air and fuel and is getting enough spark and at the right time, the engine will usually be OK, and maximum RPM’s will result. However if the RPM’s are down and you believe the tachometer, look for an engine problem.The hull, engine, and jet unit are the three main areas to look at when your performance is down. The Guardian engine protection system will reduce your max RPM to around 2800-3000 if it thinks the engine could be seriously damaged by continuing to run it. Take it serious. It could be something as simple as a bad sensor, or as important as a faulty oil pump. Starting issues: While the earlier carbureted version of the Sportjet engines can be hard starting or cold blooded like any carbureted two-stroke engines; the Direct Injected 200hp Optimax should start quickly and flawlessly every turn of the key just like it did when it was new. If the engine does not start immediately, check the fuel supply first. From the fuel tank, most Optimax engines have a fuel separator filter, followed by an inline filter, fuel lift pump, and then the Mercury onboard fuel filter that has a water sensor at the bottom of it. Any blockage or failure of these fuel components can cause a hard starting or non starting issue. All filter elements should be replaced annually. In the event of a fuel lift pump failure, the system will typically not start, or start and not keep running after it does start. A good lift pump will have a “muffled clicking sound” when the key it first turned to the on position. If the engine will not start, and the clicking sound seems dry, or louder, it can indicate a faulty fuel lift pump. I carry an outboard style primer bulb and some hose clamps in my tool kit just in case of a lift pump failure. Of the three fuel pumps on the engine, the lift pump is the most likely to fail. Simply bypassing the lift pump with a primer bulb would offer a temporary method to get the boat started and running normally. (NOTE: The fuel lift pump requires special Odiker clamps and should be replaced by a qualified technician or with the proper size clamps and Odiker pliers, due to high fuel pressures. The same “4 beeps every 3 minutes” horn will go off if you have water in the gas. That is an indication that water has made it past the water separator filter (they can only hold so much) and proceeded into the black canister type filter on the port (passenger side) of the engine. You can tell it is the main filter as it has a sensor on the bottom of it. Ideally you should drain both the water separator filter if the horn is going off, or at the least, pull the sensor wire off the bottom of the filter (wiggle and pull straight downward), then using a filter wrench of the appropriate size, remove the main filter and dump it into a container to check for water. The filter can be reinstalled if you do not have a spare, which is recommended. If you do not have a filter wrench, you can also remove the sensor wire, and using a end wrench, remove the little sensor at the bottom of the filter. This will allow fuel/water to drain from the bottom of the element. Holding a can or plastic container under it, cycle the key on and off (do not start) to activate the fuel lift pump, which will purge some fluid from the lines until you see clean fuel. (2-4 times is generally adequate). Re-install the sensor and push the wire fitting back onto the sensor pin and you should be good to go. If the horn goes off again, repeat the procedure until it stops indicating no more water. BF screwdriver Because there are times a LF screwdriver just won’t do the job. RescueTape” Ideal for patching a leaky hose, etc. Aluminox: Great for emergency repairs/cracks/holes in aluminum. Also cures underwater. Step 1 is to stop the boat in at least a foot of water, shut off the engine, restart, and attempt to get back on plane. Step 2 If that does not work, get the boat back on step, and slam the throttle back and forth between 4000 RPM and 5500 RPM in an attempt to dislodge the driftwood. Step 3 would be to come back off step, and put the boat in reverse, turning the wheel left to right and increasing the RPM until the pump ventilates the air bubbles and water entering the pump may dislodge the debris. Step 4 is to find a cut bank with adequate water, and nose the boat up against the cut bank. Then aggressively jam the throttle back and forth. The boat will remain stationary but the rocking and ingesting of water with a load against the boat may dislodge the stick. I have done this successfully on more than one occasion. Step 5 is something I have only had to attempt once in 15 years, and to my surprise, it worked! After unsuccessfully trying to dislodge the stubborn soft wood that was attached to my impeller using all 4 previous steps, I idled down river until I found a tapered gravel shelf with water rushing over it. I nosed the boat halfway onto the gravel shelf, so that the boat was just slightly hung up on the bar. I tapped the throttle slowly and intentionally ingested small pebbles and rocks at about 2,500-3000 RPM, or just enough to propel me forward, as the boat drug across the gravel bar. I could hear the small gravel going through my pump and felt a significant increase in thrust as the pebbles jarred loose the driftwood stuck on my impeller blade. Of course, I had the full UHMW bottom on my boat, (would never own one without it anymore), and that made it effortless to move slowly across the gravel bar, even with three guys and gear in the boat. This trick could be attempted with a boat without UHMW, however I would suggest that the people in the boat walk next to it to remove weight and minimize drag. Grass is the enemy of most jets. The Sportjet intake is much larger than most boat intakes, like outboard jets, single stage axial flow pumps, etc. I have found that the Sportjet pump can still get on step and maintain plane even with the back 20-25% of the intake surface loaded with grass. In the event you get grass stuck in the intake enough to reduce your performance, stop the boat, turn off the engine, and stomp the stomp grate multiple times. It may take 10-20 stomps in some instances to rip the grass loose, vs the 2-3 times needed for rocks. You should be able to see broken grass blades floating up near the stern of the boat. Many times I have completed my trip and when I put the boat back on the trailer at the landing, I found handfuls of grass still stuck in the very rear of the intake. It is amazing to me the ability of this pump to perform even with that much grass blocking the water flow. We have just developed cool a new specialized Sportjet grass rake for areas that are thick with floating grass. Loading a Sportjet boat on a properly adjusted boat trailer is almost effortless providing you do not make the same mistake that most boaters due. DO NOT BACK TOO MUCH TRAILER IN THE WATER! 1) Back the trailer in 90 degrees to the water’s edge. (Never angle the trailer downstream- it puts one wheel lower than the other) Back up trailer until the rear 12”-18” of the bunks are just under the surface of the water, no more. The trailer should look very dry, and almost as if there is not nearly enough trailer in the water for loading. Approach the trailer slowly, at about a 45 degrees angle facing upstream. Once the boats nose is “cradled” in between the bunks, turn the steering wheel downstream and slowly increase throttle. As you feel the boat nose centering on the trailer toward the roller, increase RPM even more until the boat is at or very close to the roller.. Leave some throttle on and have someone secure the strap. (Remember the strap always goes under the roller, not above.) Chop the throttle, kill the engine, and winch the boat the final few inches so that it is tight against the roller. The wife will be so impressed! Of course boats are typically designed to run in temperatures above freezing, but in places like Alaska, that can happen in August and September. In the event you are operating the boat in temperatures that can get down below freezing, and especially in the 20’s (overnight) or lower where water in the lines form the pump to the engine can occur, there are some ways to prevent or resolve freeze up issues. The primary water feed line from the jet to the engine is located on the driver (starboard) side of the engine, near the bottom of the block. It is a black 1/2” line that sits just above the water flush line (same size line) on most model sportjet powered boats. The water feed line is routed over to the port side of the engine where is attaches to the fuel rail and air handler system. (If your boat is equipped with an optional sand trap, you will also need to clear any water from the bowl and water lines and reinstall.) In the event that slush or ice builds within this line, it will prevent water flow to these components and generally trigger the overheat horn (solid horn) and/or indicate OVERHEAT on the Smartcraft deluxe gauge. The solution is to turn the ice back into water so that the flow of water can resume. Do this by warming up the line with your hands, hot rags, or whatever safe method you have to increase the temperature of the hose. The other option is to remove the clamp from the hose end or ends and thaw the ice out before reinstalling it. Once the ice or slush is removed restart the boat to determine if the blockage is removed and the horn does not sound. It is always better to leave your boat in the water vs on the trailer in these severe conditions as the water is warmer than the air when the ambient temperatures fall below freezing. Remember to start the engine just before turning on the water spigot, and when you are done, turn the turn the water off just before shutting the engine down. Failure to follow this process could lead to water ingestion where it does not belong. If the boat was equipped with a Heatercraft heater (the type that run off the engine hot water and were built before 2012), open the T fittings to let them drain, and/or if available, use pressurized air to force the water out of the lines that are hooked to the heater unit. Our newer diesel heaters do not need any winterization. It is always a good idea to add fuel stabilizer to the remaining fuel, and fog the engine or have it done at a marine shop for maximum protection during the long off season. When you put the boat away for the winter, remove the canvas and store it in a warm garage or in cold storage where it cannot be handled. Put the nose of the trailer up after chocking the tires, and make sure the drain plugs are out. Then put a sawhorse or block under the tongue so that all the weight of any snow, etc is not on the tongue jack. It’s a good idea to grease the bearing zercs and inflate the tires to specs at the same time.